The heater is older than 10 years old. It simply doesn’t keep you warm like it used to. The cost of operating and maintaining the heater is more than 50% the cost of a new one. If these conditions are not met, there’s still a chance that your heater can benefit from repairs and maintenance. Next, it’s time to decide on what kind of heater you want. Have you used a furnace your whole life? Maybe a ductless heat pump could be more convenient for you. Realize that you hate the feeling of warm air blowing through the home? A boiler might be just what you need. 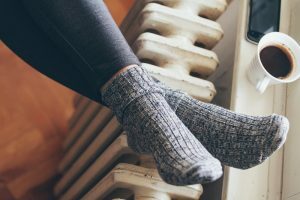 Many homeowners stick to one heating system their entire lives, simply because they haven’t considered the other options. In addition to the type of system, you’ll also want to take into consideration the required fuel type. Most systems have both electric and natural gas options, which can influence your decision. Before committing to a certain type of heater, think about how long you plan to live in your current home. You wouldn’t want to install something too efficient and expensive if you’re just going to move out soon anyways. For example, a boiler requires a more complex installation than other heaters—it’s not something you want to leave behind after just a few years of use. On the other hand, if you need heating for the short-term, an electric furnace is easy to install, inexpensive, and will get the job done. Finally, we can’t end without talking about efficiency ratings. The efficiency rating is what’s going to make you weigh out your options and might require the help of a heating expert in Frisco, Texas. Spending more money on a high-efficiency unit will certainly pay off in the long-run. You’ll be able to experience lower costs on your monthly heating bill. Or, you can save money on your installation and settle for something less efficient at the cost of a few dollars more on every heating bill. Efficiency depends not only on the heating system, but the type of fuel it uses, your home, and your own heating habits. Need help finding the perfect heating system? Contact Hutchins Plumbing & Air Conditioning to speak with an expert. Get it done right… Right now!